This was the first Home Defence squadron, being formed on 18 March 1916 by expanding the Home Defence Flight at Cramlington to squadron status. Tasked with the defence of the east coast from Whitby to Newcastle and in November ones of its aircraft was successful in bringing down the Zeppelin L34 over County Durham. However, this was the squadron's only success and with the withdrawal of the Zeppelins from action over Britain the squadron reverted to a training role until it disbanded on 13 June 1919. 36 reformed by re-naming the Coast Defence Torpedo Flight at Donibristle on 1 October 1928 equipped with Hawker Horsleys. Two years later the squadron embarked for Singapore, arriving in November 1930, although the aircraft had been sent to India where they were re-assembled and flown to Singapore across India, through Burma and finally Malaya arriving in December. The Horsleys were replaced by Vildebeests in July 1935 and these remained its equipment when the Japanese attacked Singapore in December 1941. Heavy losses resulted in the aircraft of No 36 and No 100 Squadrons being pooled and eventually withdrawn to Java and Sumatra where last two were lost on 7 March, effectively ending the career of No 36 Squadron, which ceased to exist on the 8th. 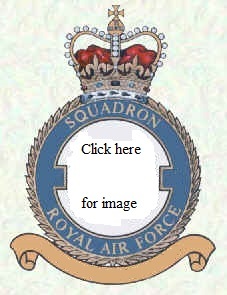 A new 36 Squadron was formed on 22 October 1942 at Tanjore in India. Its equipment in the form of Wellingtons arrived in December and it began anti-submarine patrols off the Indian East coast. However, the scarcity of Japanese submarines in the area prompted a move for the squadron and in June 1943 it transferred to Algeria. It continued to operate from North Africa until September 1944 when again lack of possible targets resulted in its return to Britain. Arriving at Chivenor on 26 September 1944 it moved north to Benbecula in March 1945 where it disbanded on 4 June 1945. It next appeared as a Mosquito strike squadron when No 248 Squadron at Thorney Island was re-numbered on 1 October 1946 but just over a year later on 15 October 1947, the squadron disbanded once again. From 15 February 1949 the squadron number was linked to No 203 Squadron, flying Lancaster GR Mk 3s from St Eval and later Topcliffe. It regained its individual identity on 1 July 1953 when it reformed as a Neptune squadron at Topcliffe but unlike other MR units it did not re-equip with the Shackleton and disbanded on 28 February 1957. The squadron reformed for the final time on 1 September 1958, this time in the transport role equipped with Hastings at Colerne. The squadron moved to Lyneham in August 1967 and at the same time re-equipped with the Lockheed Hercules but on 3 November 1975 the squadron disbanded for the last time. Home Defence, 1916-18: Eastern Waters, 1942-43: Mediterranean, 1943: Atlantic, 1944-45. Originally formed as an experimental unit at the Experimental Station, Orfordness on 15 April 1916, it was absorbed by the station in May, thereby losing its individual identity. However, a new 37 formed on 15 September 1916 as a Home Defence unit to cover the South-East. With headquarters at Woodham Manor it operated from landing grounds at Goldhanger, Rochford and Stow Maries. The squadron had one success with a BE12 brought down the Zeppelin L48 over Suffolk on 16/17 June 1917. The squadron moved to Biggin Hill in March 1919 where it received some Snipes but on 1 July 1919 it was disbanded by being re-numbered No 39. No 37 came back to life on 26 April 1937 when 'B' Flight of No 214 Squadron was expanded to squadron status. Equipped with Harrows at Feltwell it was now operating in the bomber role. Wellingtons were received in May 1939 and six of these were immediately in action on the outbreak of war. The horrendous losses sustained in these early daylight operations led No 37, together with the rest of the 'heavy' bomber force to turn to night bombing, however, in November 1940 the squadron was transferred to the Middle East. Initial operations were carried out from Malta but by mid November the squadron was settled in Egypt. From here it carried out missions over Libya and a detachment operated from Greece over Albania and later Bulgaria. During May 1941 its Wellington's were involved in support of the operations around Habbaniya following the Iraqi uprising, after which it returned to operations over the Western Desert and Italy. It moved west following the 8th Army advances to Libya and later Tunisia. The squadron left Africa in December 1943 when it moved to Italy, where in October 1944 it started to re-equip with Liberators. The Liberators were used from December 1944 to bomb targets in Italy, Yugoslavia, Hungary, Bulgaria and Albania as well as drop supplies to Yugoslav partisans and mine the Danube. The squadron remained in the area after VE-Day but moved to Palestine in October 1945 , a move which was short-lived as it moved back to Egypt in December. The squadron disbanded Shallufa on 31 March 1946. Having originally been reformed from No 214 Squadron, it is ironic that on 15 April 1946, No 214 was re-numbered 37. It was now flying Lancasters but just under a year later on 1 April 1947 the squadron disbanded again. A new 37 Squadron formed from an element of No 38 Squadron at Ein Shemer in Palestine on 14 September 1947, equipped with Lancasters again but now in the Maritime Reconnaissance role. The squadron began moving to Malta in April 1948 and by 19 May was fully re-located. Shackletons replaced the Lancasters in August 1953 and in August 1957 the squadron was again transferred, this time to Aden. It continued to operate in the protectorate until the run down to withdrawal began and it disbanded at Khormaksar on 7 September 1967. To date the number has not been revived. First formed on 1 April 1916 at Thetford, it was soon redesignated No 25 (Reserve) Squadron. Formed again on 14 July 1916 at Castle Bromwich it became a Home Defence unit, moving its headquarters to Melton Mowbrey in October. It operated flights from landing grounds at Stamford, Buckminster and Leadenham. It continued to act in the night defence role covering the Midlands until May 1918 when it was redesignated as a night bombing unit. It took its FE2bs, received in September 1916, to France leaving a nucleus which was formed into No 90 Squadron. It began operations in June 1918 but in August returned to the UK to convert to 0/400s, which failed to materialise and so it returned to France with its FEs, which it flew until the end of the war. The squadron returned to Hawkinge in February 1919 where it disbanded on 4 July. The squadron reformed on 16 September 1935 at Mildenhall from 'B' Flight of No 99 Squadron. It was initially equipped with Heyfords but these where replaced in November 1936 by Hendons, becoming in the process the first RAF squadron to operate monoplane bombers. Wellingtons were received in November 1938 and the squadron continued to fly this type, in various variants until 1946. It operated with Bomber Command until November 1940 when it was posted overseas. It spent the remainder of the war operating in the Middle East and Mediterranean areas. It carried out attacks against targets in Libya, Italy and the Balkans until January 1942 when it converted to the night torpedo role and continued on these operations until January 1943, after which it reverted to anti-submarine patrols reconnaissance and minelaying duties. In 1944 it operated from Greece and also undertook supply dropping mission to the Yugoslav partisans. The end of the war brought a move to Malta in July and re-equipment with Warwicks which it used on air-sea rescue work, these were replaced by Lancaster GR Mk 3s in July 1946, when it reverted to the maritime reconnaissance role. From September 1946 to Mar 1948 the squadron was based in Palestine, but then returned to Malta, becoming the resident MR squadron. It converted to the Shackleton MR Mk 2 in 1954 and retained these until finally disbanding at Luqa on 31 March 1967. Another of the Home Defence squadrons, No 39 was formed at Hounslow on 15 April 1916 and operated detachments at Hainault Farm and Sutton's Farm. In August a detachment was established at North Weald. Operations against Zeppelins and later Gotha bombers continued until November 1918, initially with BE2s and from September 1917, Bristol F2Bs. On 3 September 1916, it was responsible for the destruction of the first airship over Britain when Lt William Leefe Robinson shot down SL11 over Cuffley, for which he received the VC. Other airships destroyed by the squadron were L32 (2nd Lt F Sowrey), L31 (2nd Lt W J Tempest) and L33 whih was brought down by AA fire assisted by 2nd Lt A de B Brandon. However, in November 1918 the squadron was sent to France but five days later the Armistice came along and the squadron disbanded on 16 November 1918. However, 39 was soon back when No 37 was re-numbered on 1 July 1919 at Biggin Hill but remained a cadre (no aircraft) until February 1923 when DH9As were received at Spittlegate near Grantham. The squadron transferred to India in December 1928 and received Wapitis in February 1929 which were used for patrolling the North-West Frontier. Harts arrived in November 1931 and Blenheims in August 1939, following which the squadron transferred to Singapore. Returning to India in April 1940,it was intended that the squadron should carry on to the Middle East but was diverted to Aden instead. From here it operated against Italian targets in East Africa until November 1940 when it moved to Egypt. New equipment arrived in January 1941 in the form of Marylands, which it used for strategic reconnaissance duties until January 1942. Beauforts were also operated in the anti-shipping role from August 1941 and this became its main role following the withdrawal of the Marylands in January 1942. Early in 1942 it kept a detachment in Malta and on 20 August this element amalgamated with similar elements of No's 86 and 217 Squadrons to become 39, whilst the rest of 39 joined No 47 Squadron. Continuing in the torpedo bomber role its Beauforts were replaced by Beaufighters in June 1943. With Beaufighter it added night intruder sorties to its list of roles, operating all around the Central Mediterranean area. A move to Italy in July 1944 allowed it to operate over the Balkans as well as the coasts of Italy and French coasts. Marauders began to arrive in December 1944 and it resumed operations in February 1945, but in October it was transferred to the Sudan and re-equipped with Mosquitos, where it disbanded on 8 September 1946. Reformed at Nairobi in Kenya on 1 April 1948 the squadron flew Tempests in the area until disbanding on 28 February 1949. The following day it reformed at Fayid in the Canal Zone as a Mosquito night fighter unit tasked with the defence of the Suez Canal. It received Meteors in March 1953, moving to Malta in January 1955, disbanding at Luqa on 30 June 1958. Another 39 Squadron appeared the next day when No 69 Squadro9n at Luqa was re-numbered. It operated Canberra PR Mk 3s in the photo-reconnaissance role from Malta until Oct 1962 when PR Mk 9s were received. In September 1970 it returned to the Wyton were it continued to operate in the same role until disbanding on 1 June 1982. Its final incarnation began on 1 July 1992 when No 1 PRU at Wyton, equipped with Canberra PR Mk 9 aircraft was re-numbered 39, moving to Marham in December 1993, where it also received Canberra PR Mk 7s. The PR 7s were gradually retired as where the PR 9s until the squadron was only operating three of the latter and finally on 28 July 2006, the squadron was disbanded. The squadron reformed in early 2007, absorbing No 1115 Flight as the first RAF squadron to operate unmanned reconnaissance/attack aircraft in the form of Reaper UAVs, receiving its new standard at Creech Air Force Base in Nevada from AM Ian McNicoll on 23 January 2008. The squadron is a tri-service unit, based at Waddington but operating remotely with the USAF in Nevada, some of its personnel operated in Afghanistan from October 2007. Formed at Gosport on 26 February 1916, it was equipped with FE8 fighters which it took to France in August. When in March 1917 a patrol of nine FE8s was shot down the squadron was immediately re-equipped with Nieuport Scouts. SE5As arrived in October 1917 and it continued to use these until the end of war. Returning to Tangmere in February 1919 the squadron disbanded on 4 July 1919. When it reformed on 1 April 1931, the squadron adopted the day bomber role equipped with Gordons at Upper Heyford. Harts arrived in November 1935, by which time it was stationed at Abingdon and on 7 January 1936 'C' Flight became No 104 Squadron. Hinds replaced the Harts in March 1936 and Battles arrived in July 1938. On the outbreak of war the squadron became part of the AASF and moved to France but in December it returned to Wyton where it converted to Blenheims continuing to operate over France but from its UK base instead of the continent. In November 1940 the squadron moved over the night bombing role when it received Wellingtons. From October 1941 it began to send aircraft over to Malta on a rotational basis whilst continuing to operate from the UK, but on 14 February 1942 the detachment in Malta took over the No 40 numberplate when the element in the UK was re-numbered No 156. It then withdrew to Egypt where it was able to re-equip and then operated from the Canal Zone against targets in the rest of North Africa. Following the capture of airfields in Tunisia it moved further forward and in December 1943 moved over to Italy, where it was now able to add the Balkan and Northern Italy to its target list. Liberators arrived in March 1945 and it remained in Italy until October when it returned to Egypt, where the Liberators were replaced by Lancasters in January 1946, the squadron disbanding on 1 April 1947. No 40 was reformed, this time in the transport role, on 1 December 1947 at Abingdon. It flew its Yorks constantly throughout the Berlin airlift, moved to Bassingbourn in June 1949 but disbanded there on 15 March 1950. Its final incarnation, so far began on 28 December 1953 as a light bomber unit equipped with Canberra B Mk 2 aircraft. It operated these from Coningsby, Wittering (Feb 1954) and finally Upwood (Nov 1956) but on 1 February 1957 it disbanded, although the number was linked to No 50 Squadron which lasted until 1 October 1959, since when the number 40 has not appeared in the RAF's order of Battle. Award of Standard originally announced on 15 Oct 1957, effective from 1 Apr 1957 but was never presented. Whilst the announcement of the award of a standard to the squadron appeared as shown opposite, no battle honours were ever determined owing to the standard never being produced.